I've been attempting to wean myself off my bad (but oh so good) foods in the last week, in preparation for my attempt at a professionally created diet, which starts next week. During my weaning, I've been frantically researching healthier things I can eat to keep me from reaching for the bread, cakes or cereal I love so much. One of the snacks I've found is a new drink that's full of goodness and nearly empty of calories. 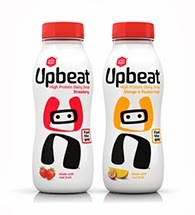 Upbeat is a high protein, low fat and nutritious drink, made with whey. which contains the 9 essential amino acids our bodies need, but cannot create on their own. Protein keeps you fuller for longer, and each drink contains the same protein you would find in a chicken breast or 4 eggs, so is ideal for me when I'm trying to reduce my sugary cravings! The drinks, which come in two flavours, Mango & Passion Fruit, and Strawberry are full of calcium, and are only 150 calories. My favourite is the strawberry one, and they have been brilliant in keeping my cravings at bay. My worst times of day tend to be mid-morning and late afternoon, so I have been having them mid-morning, and have found I have been able to go longer before lunch, which in turn has helped me avoid wanting a late afternoon snack too! One of the reasons I have been having rubbish snacks lately, is down to bad organisation- I tend to always be in a rush when trying to leave the house, as something is always keeping me and Chunk from getting things done on time. This means I tend to grab the easiest snack I can find to take out with me, like crisps or cereal bars. These bottles are just as easy to grab from the fridge, and far healthier, so I'm feeling far more confident at being able to sort my post-baby body out now! Upbeat have even given me some great things to give away on this blog as my very first competition! Enter my competition here. Upbeat can be found in most Tesco and Holland & Barrett stores. I'd never heard of Up-Beat. Thanks for your post.